Our programmers and developers have great experience in consulting, programming, engineering and implementing websites for a diverse collection of major industrial sectors because of this they are able to understand what you really want and consequently they have the knowledge to make it happen for you. Their experience extends across national and international advertising/marketing, financial, entertainment and manufacturing, automotive, healthcare, software development and mortgage firms. They have worked on all levels of software and web development; and their understanding of contemporary technologies include the knowledge of relational database technologies from the earliest IMS implementations of DB2, Informix, and Sybase; through to SQL Server 2008, and other object-SQL DBMS; and PC databases from dBase for CP/M, through Clipper, Paradox, FoxPro, Visual Basic, and Visual FoxPro; and Microsoft Access. Their knowledge and experience also extends to state-of-the-art visual and object-oriented development technologies through to Visual Studio .NET 2008 and SQL Server 2005 To these skill-sets; they add experience with past and contemporary web-development technologies including Visual C# and Visual Basic.NET, HTML, XHTML, XML, CSS, RSS, NET framework, AJAX and Scripting, Adobe Dreamweaver, Fireworks; video streaming, with some knowledge of the newest offerings from Microsoft in WCF, WPF, and WWF. Finally, they put on the table our abilities to satisfy your customer's needs, requirements, and desires as a matter of course; not to be taken lightly; but with diligence and care for the user experience; as one that can see to that, with confidence, that your needs will find expression through their artistry and skills in fulfilling those goals you wish to reach; and the greatest consideration for you and your company's well-being and your continuing profitability and success. Solid understanding of stored procedures, triggers, user-defined functions, and relational database design; including legacy ETL to SQL from several different platforms and other database designs based OOP. Good understanding of web application architecture and design. Excellent understanding of XML/Web services including .NET Remoting strategiesv Good understanding of maximizing user experience on intranet and internet sites with video-streaming, multi-threading, and caching strategies with .NET technologies. We are Microsoft VB developers since 1993 (v.3.0); but prefer .NET C# development and ASP.NET Framework 2.0-3.5 development. I also we have worked with Visual C++, Visual FoxPro.Good understanding in PHP, Adobe ColdFusion, Adobe Flash, and music and video compression algorithms for presentation. For more information about Website Design in Los Angeles, web creation and Internet development, web programmings, or website maintenance services, please contact us for a free quote today! We also have a dedicated web marketing SEO Expert, who can help you improve your ranking in the search engines such as Google.com, Yahoo!, Bing and MSN. 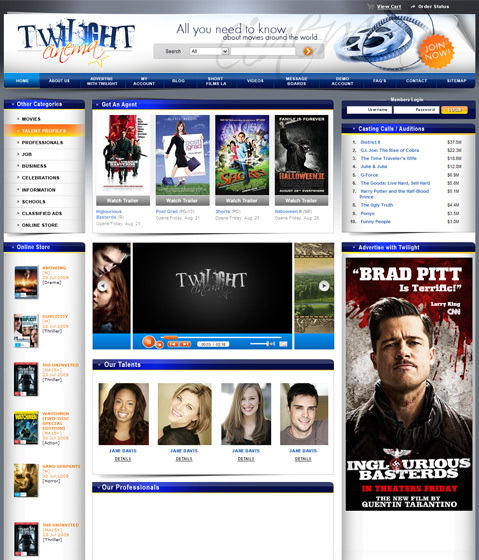 Website design and development for Hollywood studios, film makers and production companies.